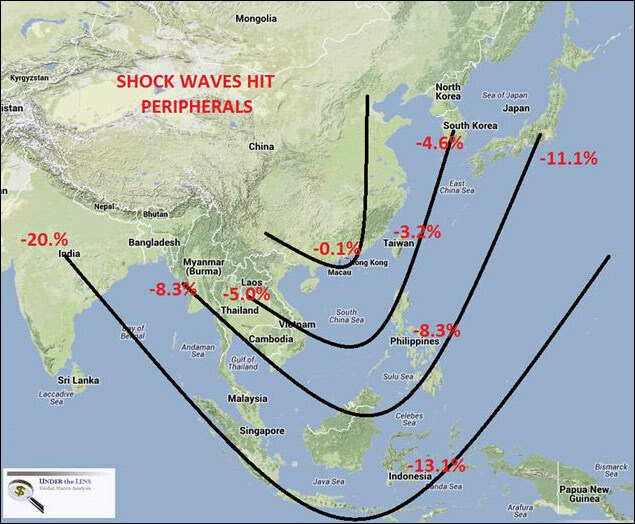 Shock waves are washing ashore across Asia and the emerging markets and have already destabilized sovereign capital flows. It is eerily reminiscent of the Asian Crisis of 1997. Many are quick to point out that this time it is different because.... These are words that always cost investors the most! The Euro Crisis started in the peripheral countries (PIIGS) and eventually spread to the EU core. 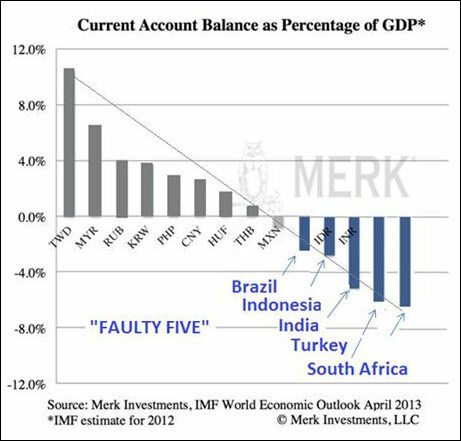 A potential global crisis has begun in the "faulty five" peripheral countries (BIITS) and has already spread to the global core as currency reserves, often held in US Treasuries, are sold (forcing up global yields) to fight falling currencies, rising interest rates and capital flight. Yes it may be different this time with better abilities to absorb the shock waves. A combination of flexible exchange rates, strong international reserves, better monetary regimes, and a shift away from foreign-currency debt are certainly helping. However, years of political paralysis and postponed structural reforms in the BIITS have created serious destabilizing vulnerabilities. 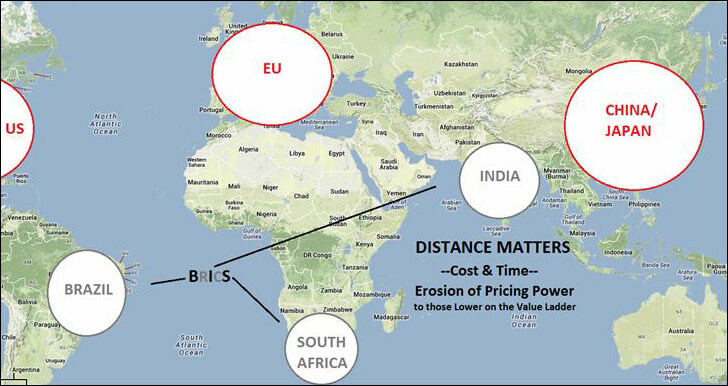 Brazil, India, Indonesia, Turkey and South Africa (BIITS) all have something very important in common, they are all peripherals to their major markets! Additionally, and maybe not by coincidence they also all have large Debt to GDP ratios and significant negative Current Accounts. 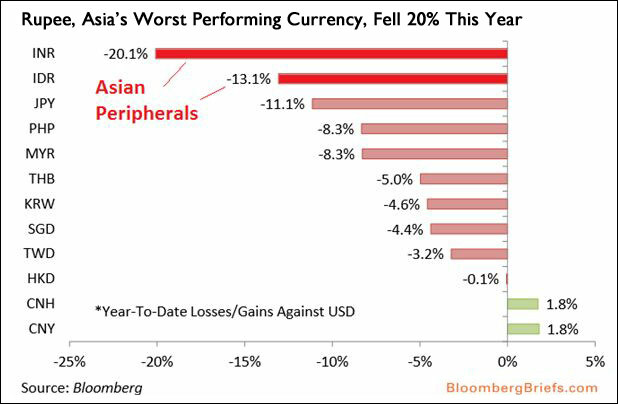 BRICS elements (Brazil, India and South Africa) hit hard. Being a peripheral does not mean causation, but it does mean additional time and cost. When money and credit tightens, time and cost matter. Labor arbitrage can surmount this differential but it is removed when pricing pressures mount and those higher on the value-add ladder have more pricing power. Sovereign debt doesn't matter, until in matters. It matters when current accounts go negative. Large current-account deficits are a problem as are real exchange rate appreciations. These are well understood as key macro predictors. Going forward expect net external debt to additionally become more critical. Watch for Japan to teach us this lesson as the shock waves echo back towards the core. All of these have changed negatively since the talk of "taper" began. The Internet may be making the world smaller, globalization may be removing borders, but sometimes distance simply matters! Remember, culture differences still vary by distance.